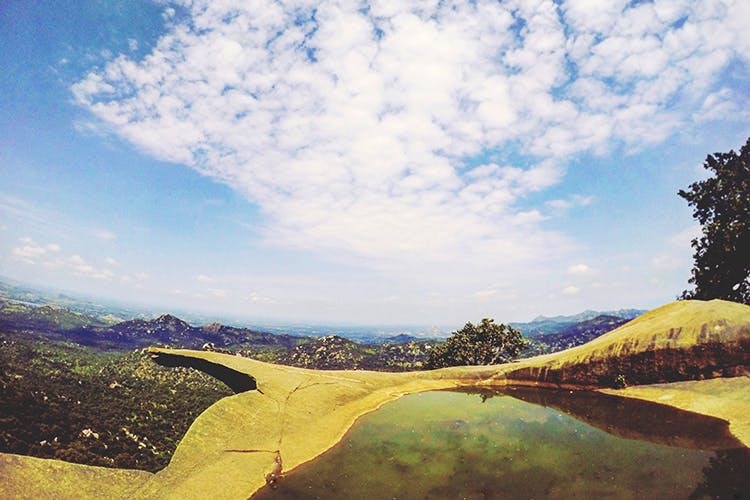 An easy 100km-drive from Bangalore, Avalabetta near Chikkaballapur is a mini version of Nandi Hills, minus the crowds. The view of the surrounding landscape is spectacular. If you don’t have enough time to make it for a long holiday, or even a short one for that matter, make time for one day away from town and head to Avalabetta. What is unique about the hill top is that the edge of the cliff juts out of the hill just. Just enough to sit up on or stand – for that perfect edgy Instagram shot! Of course, it’s not advisable for those who have a fear of heights. And even if you’re a daredevil, be super careful as there’s no support and is a sheer freefall drop. But the view is magnificent. We took our own time in just gazing into the endless fields and hills. Bliss! Ideal for nature lovers and adventurists, the area also has little water spots formed in the stone over time. If the water’s fresh, a cooling of feet is certainly in order. It is quite an adventure getting across the rocks on the hill. And we were also keen on visiting the small temple that’s on the hill too. In fact, we clubbed the temple run with a quick visit to the Gudibanda Fort which is just a few kilometres away. Since the trek is a bit long, make sure to carry plenty of water and snacks as there are very few local shops selling anything to fuel you up. Oh, and make sure to take sunscreen lotion and shades – the sun can get quite piercing. The best time of the year to visit is now, as during the monsoon, the rocks can get quite dangerous. Get there early in the morning to avoid the heat.